A pin bearing is a type of fixed bearings that accommodates rotations through the use of a steel. Translational movements are not allowed. 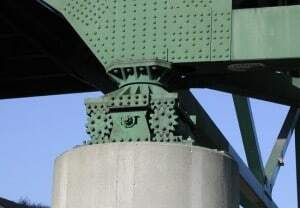 The pin at the top is composed of upper and lower semicircularly recessed surfaces with a solid circular pin placed between. 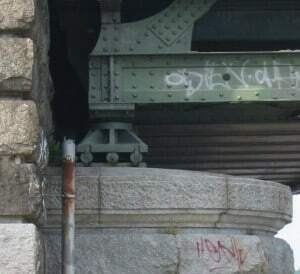 Usually, there are caps at both ends of the pin to keep the pin from sliding off the seats and to resist uplift loads if required. 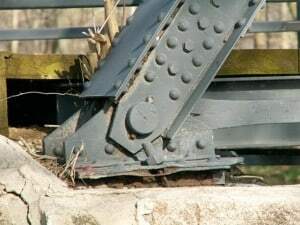 The upper plate is connected to the sole plate by either bolting or welding. 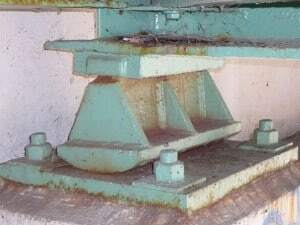 The lower curved plate sits on the masonry plate. Rotational Movement is allowed. Lateral and Translational Movements are Restricted. AASHTO requires that expansion rollers be equipped with “substantial side bars” and be guided by gearing or other means to prevent lateral movement, skewing, and creeping (AASHTO 10.29.3). 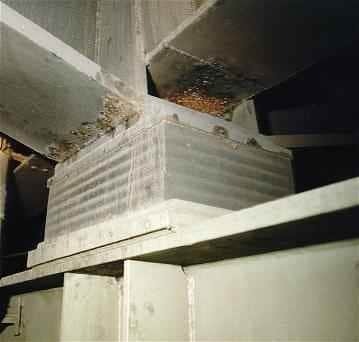 A general drawback to this type of bearing is its tendency to collect dust and debris. Longitudinal movements are allowed. Lateral Movements and Rotations are Restricted. 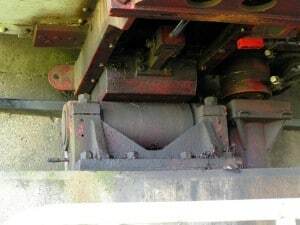 A rocker bearing is a type of expansion bearing that comes in a great variety. It typically consists of a pin at the top that facilitates rotations, and a curved surface at the bottom that accommodates the translational movements. Rocker and pin bearings are primarily used in steel bridges. A POT BEARING consists of a shallow steel cylinder, or pot, on a vertical axis with a neoprene disk which is slightly thinner than the cylinder and fitted tightly inside. A steel piston fits inside the cylinder and bears on the neoprene. Flat brass rings are used to seal the rubber between the piston and the pot. The rubber behaves like a viscous fluid flowing as rotation may occur. Since the bearing will not resist bending moments, it must be provided with an even bridge seat. It consist of a laminated elastomeric bearing equipped with a lead cylinder at the center of the bearing. The function of the rubber-steel laminated portion of the bearing is to carry the weight of the structure and provide post-yield elasticity. The lead core is designed to deform plastically, thereby providing damping energy dissipation. Lead rubber bearings are used in seismically active areas because of their performance under earthquake loads.